We are approximately one and a half miles west of York city centre. There is ample parking at the kerbside on Acomb Road. The Sat nav postcode for parking is YO24 4AE. The Carlton Tavern pub (3-4 minutes walk from the windmill towards Acomb) on Acomb Road have also kindly allowed us to use their car park (ideal parking if you are visiting both the Windmill and the Cold War Bunker and also looking for somewhere for food and drink). Please do not park in Windmill Rise as it is a narrow residential street and we don’t want to cause disruption to our neighbours. The Sat nav postcode for parking is YO24 4AE. There are several bus services from the city centre which stop very close to the mill. No’s 1, 5, 5A and the 59 Park + Ride bus to Poppleton Bar stop close to the mill, but please check the timetables on the First York website here. 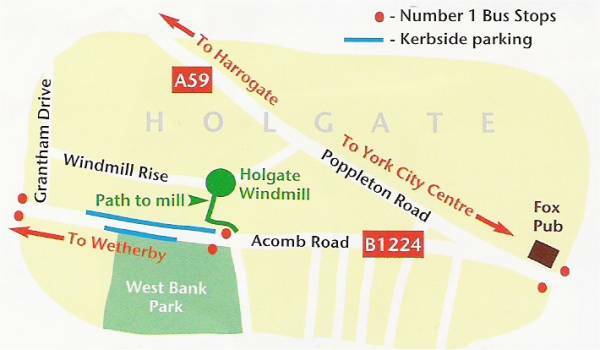 We are also only 20-25 minutes walk from the railway station (via Blossom Street & Holgate Road).